All my wigs are brand new with tags and have care instructions included. Made of synthetic wig fiber, but feels like real hair! Cute Carol Wig. Looks like Stockard Channing from Grease! Made of 100% Joyokalon .. this is layered with a tapered back. 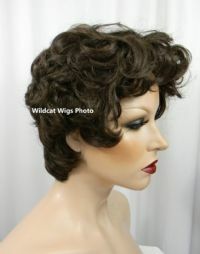 This has a wide 4" skin top .. wavy hair. This is a top quality wig. The cap is adjustable to fit the average to average/larger head. This listing is for color 6 -Chestnut Brown. I usually have this in stock and ready to ship. Please order carefully .. ALL SALES ARE FINAL WITH NO EXCEPTIONS FOR HEALTH REASONS.